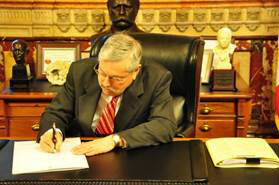 Governor Terry Branstad signs the collective bargaining bill into law. Iowa Governor Terry Branstad signed the collective bargaining bill into law today. The bill which limits the subjects Iowa teachers and other government workers may bargain over during contract talks passed the House and Senate Thursday. A Republicans in the Senate voted for the bill and all but six Republicans in the House approved the bill. Governor Branstad signed the bill into law today (Friday) and released a statement saying: “These necessary reforms to our antiquated 43 year old public employee collective bargaining law bring fairness for Iowa taxpayers and flexibility to public employees.” He also thanked the legislators who worked on the bill. The head of the state’s largest employee union, Danny Homan, announced shortly after the bill passed the Senate Thursday, that he will file a lawsuit to try and block it. Homan says it is unconstitutional.